The LG G7 ThinQ will likely be lambasted for its notch and awkward name, but one thing they seem to have gotten right is the new display. The G7 ThinQ will give many a first look at a new type of panel with lots of promise. While it was previously limited to TVs, from what we know, it should really shine on a smaller screen. Unlike last year's reintroduction to POLED, Super Bright Display is more than a marketing term. The panel, which was called M+ when used on televisions, was previously rumored to be called MLCD+. However, days before the G7 ThinQ release, LG decide to introduce its new name of Super Bright Display. While the notch will probably be the most debated topic of the new G series, we doubt people will be complaining about this new display. What Is a Super Bright Display? Super Bright Display was first introduced in 2015 as a new panel type for LG's television lineup. Originally known as M+, the new panel's biggest advantage over traditional IPS LCDs was the usage of an additional white subpixel. LG has rebranded the name to Super Bright Display for its introduction into the mobile industry, and the first phone to use it is the LG G7 ThinQ. Traditional LCD panels are composed of millions of individual pixels. 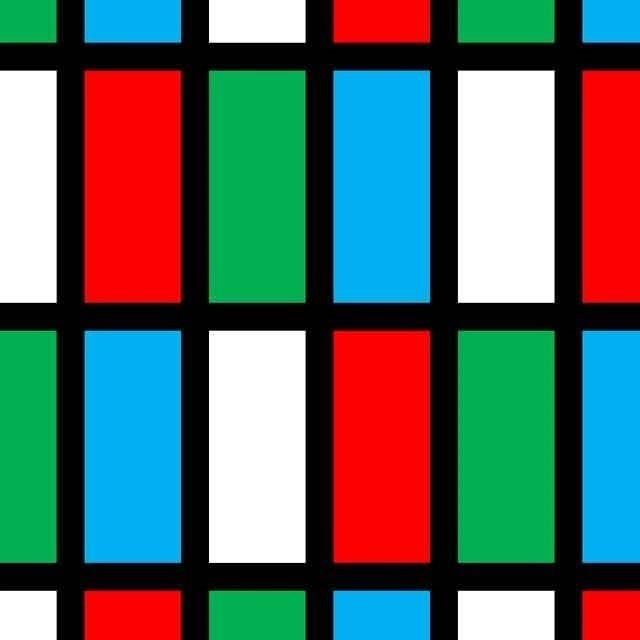 Each pixel is divided up into three subpixels: one red, one green, and one blue. Behind it all is a backlight, which shines through the pixels (and their subpixels) to produce the light emitted by the screen. By changing the opacity of each subpixel in various combinations, the light that passes through the pixel can run the entire gamut of colors, from white to black. With Super Bright Display, a fourth subpixel is introduced: white. It also uses three subpixels per pixel, but unlike RGB, it can come in four possible variations: RGB, WRB, BWR, and GBW. In other words, it's a PenTile arrangement — quite similar to what's used in many AMOLED displays. According to DisplayBlog, the backlight is the most expensive component of an LCD display. The strength of the backlight is dependent on the number of pixels, as the backlight has to be able to properly illuminate each pixel to display the image. With most flagship phones using a variation of 1440p, this adds up to millions of pixels. And with the recent trend of using edge-to-edge displays, the horizontal component is expanding, with phones (such as the LG G7 ThinQ) using 2880 x 1440 resolution (compared to traditional 2560 x 1440). Like this article you are reading, a lot of content we view on our screen is primarily white. To produce white using RGB, all three subpixels must have light pass through them, however, 60–70% of this light ends up being blocked, as the subpixels can't go completely transparent. Therefore, backlights have to be highly powerful to drive these higher resolution displays, raising the cost to both OEMs and consumers. These would also consume more battery, resulting in less time for us to enjoy our phones. However, with Super Bright Display and its white subpixels, less light is used overall, as only one subpixel needs to allow light to pass through it to create the color. According to DisplayBlog, IPS LCD panels have a light transmittance rate of 5 percent. Light transmittance rate is the percentage of light that passes through the panel, which, for traditional panels, results in 95% of the light not penetrating. However, Super Bright Display raises this number to 8 percent. While it's not a huge jump, it is a 60% increase in net translucency, which should definitely help lower power consumption (LG claims it uses approximately 35% less power). The higher light transmittance rate also improves the brightness of the screen. Since more light penetrates, using the same amount of light equates to a higher brightness level. According to LG, Super Bright Display panels are about 50% brighter than comparable RGB LCD panels. It's with this improvement that the G7 ThinQ's display will be rated for a maximum of 1,000 nits. Although Samsung Galaxy S series and Note series devices have achieved brightness level at (or higher) than this number, it required a special mode that only kicked in while the phone was in direct sunlight. With LG claiming this is the brightest smartphone display on the market, the expectation is that this brightness can be manually set. Aside from the hardware improvements, LG has also included proprietary algorithms to improve the quality of the images on its Super Bright Display screens. Using these formulas, LG was able to make improvements in peak luminance, sharpness, and legibility when compared to non-Super Bright Display panels. Super Bright Display leverages another LG technology called in-TOUCH. 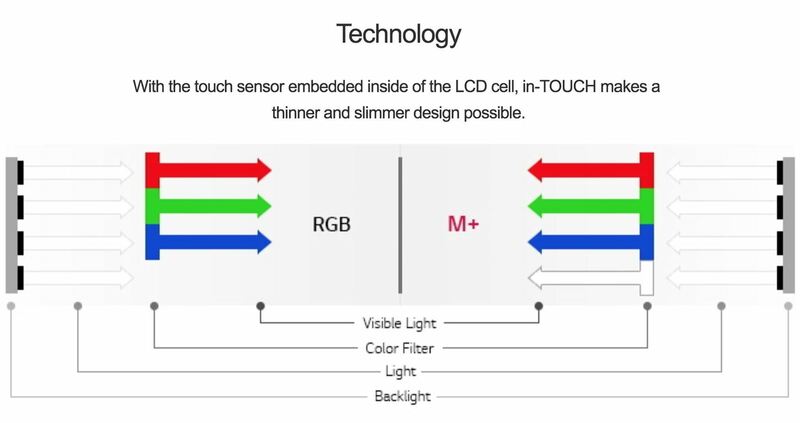 This embeds the touch sensor inside the LCD, removing the need for a separate touch panel layer. Touch sensitivity and accuracy improve, as there is less interference for both single and multitouch. Additionally, the display should see a small improvement, as the removal of the touch panel also removes an interference. Super Bright Display also covers 100% of the DCI-P3 and Rec 2020 color space. This is same color space used by Hollywood, so videos on this device will be color accurate. Additionally, like the V30, LG has included a number of settings to adjust the color reproduction based on the various content being viewed. Unlike the V30, G7 ThinQ has six different settings, including Auto, Eco, Cinema, Game, Expert, and Sports. Color levels (RGB) can also be manually adjusted while retaining the desired mode for even more precision. Super Bright Display is not a perfect technology. The introduction of another subpixel does create some issues that could affect the quality of the image. The first issue is the reduction of RGB lens. In a row with four pixels, unlike a normal IPS LCD panel, Super Bright Display panels will have only three red, three green, and three blue subpixels. The reduction of one subpixel (which is replaced by the white subpixel) could affect color balance on the display, (according to Android Authority). Android Authority also points out that the Super Bright Display will lose some contrast detail when it boosts brightness thanks to the varied arrangements of the subpixels. However, like the first disadvantage, this may not be the case in real-world examples, as a varied subpixel layout already exists in AMOLED panels such the ones included in Samsung Galaxy S8, and no such problems have been reported. While the G7 ThinQ's display is able to achieve 1,000 nits brightness, it's only through enabling a mode called "Super Bright Mode." By selecting the brightness icon located next to the brightness slider, the screen will bump up to its max brightness level. However, this mode will only last for three minutes at a time. The idea is that even with the power saving of Super Bright Display, with the lower battery capacity, sustaining such a bright screen will eat up the battery. Overheating is also possible for a longer duration at this brightness. Furthermore, my guess is LG believes this brightness is hardly ever needed, reserve for the time when the sun is directly covering our screen. Without selecting this icon, the screen will be able to achieve a maximum brightness at 650 nits, an amount that it can sustain without any time limit (for comparison, the iPhone X max out at 634 nits). Also, according to Android Police, this mode will not automatically engage when brightness is set to auto. It is refreshing to see that LG still has something new to bring to the table. With the delayed launch, the controversial display notch, and the questionable name change, the LG G7 ThinQ will probably have a hard time finding success in the flagship smartphone market. However, if Super Bright Display is all it's rumored to be, LG will have a marketable hardware difference that offers more to the consumer.